Since Leroy and I started this blog almost a year ago, we have experienced tons of firsts. The first post, the first podcast, the first convention, the first big interviews. It’s been a great run. This week, I had the opportunity of experiencing another first. This week, I bought my first ever Aquaman comic… on purpose! Now, I’ll admit that I only use the Aquaman jokes because he’s been the comic industries punching bag since he was first introduced, and I have full intentions of getting caught up on Geoff Johns’ run of New 52 Aquaman, but it really just hasn’t happened yet. I figured, since that was the case, I owed the world at least a few words on the man. I picked up Aquaman’s first contribution to DC’s Villains Month: Aquaman #23.1/Black Manta #1. Not really sure the proper format for that, but that’s not important. What is important is what the issue covers: the villain Black Manta. Cover art for Black Manta #1. Now, as I said above, I’ve never read any Aquaman comics, but I have read plenty of crossover events that feature the Atlantean, my favorite’s being Blackest Night and Brightest Day. I’ve run into Black Manta on more than one occasion, and I must admit that he is one of my favorite villains in the DC Universe. I don’t really have a valid reason, I think it’s just the cool name and the cooler helmet. Aquaman #23.1 starts with Black Manta in Belle Reve Prison, and it’s really easy to see where that’s going. Amanda Waller is there to recruit Manta for her Task Force X (colloquially known as the Suicide Squad), but there’s a prison break and Manta escapes after receiving the same coin and invitation the Crime Syndicate has been shopping around town. Manta dons his helmet and shows up to the villains meeting (which can be seen in Justice League #23, the finally part of the Trinity War that lead to Forever Evil). 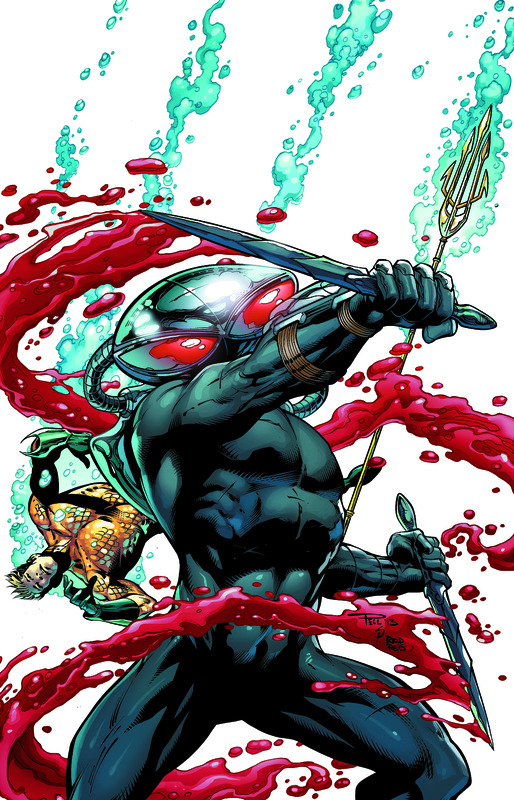 If you read that issue, you know that Black Manta takes Aquaman’s bloody trident and leaves. The rest of the issue follows Manta after he leaves the meeting, but I’ll leave that last little bit as a surprise for you. Let’s just say it that surprisingly touching, then surprisingly frantic, and then just flat out surprising. Even if you aren’t normally an Aquaman reading, this is an issue that is not to be missed. It features a solid character that you can understand and sympathize with pretty easily, and the fact that they retold his origin in a page and a half will make it very accessible. I haven’t had a chance to read all of the Villains Month one-shots that I want to, but if all of them flow into and out of scene from the larger crossovers just as simply without making the reader feel like they are missing huge chunks of other stories, then I’ll definitely be happy. After this one, I might actually be putting more effort into getting caught up on Aquaman, and that’s something I really thought I’d never hear myself say. Black Manta #1 (23.1) was strong with the force. Your review was solid and it makes the reader want more.